In this edition of Two Tales, we bring you two rising stars that have had two completely different journeys to the pro ranks. One West, one East, but both riders with very similar goals. Let’s have a read and get to know Ladner, British Columbia’s Wyatt Waddell and Burkton, Ontario’s Quinn Amyotte. Both are great young talents, and pretty solid guys off the track too. Quinn: Started riding at 2 and have been racing 14 years. Quinn: Just turned pro in 2018. Wyatt: My dad used to race back in his day. I got my first bike when I was 16 months old, a mint condition 1992 yellow #1 Yamaha PW50. I didn’t get on it till I was 4. I rode around in our backyard crashing into fences for a couple years, and went to my first race at Mission Raceway on the PW when I was 6. We bought a KTM Jr. 50 that same day. Quinn: My dad raced and my whole family grew up racing. Wyatt: Racing the KTM 50cc challenge at Vancouver Supercross with chickenpox. I also met my buddy Jess Pettis there. Quinn: Racing my brother, Bennet, on 85’s when I was only 11. Wyatt: My 2013 Jr MX2 Walton title. It was hard fought between Me, Alex Jeffery and Kyle Biro. Who ever won the final moto won the title, and I managed to holeshot and lead every lap with Alex right on my tail. Quinn: Winning a Mini O’s title. Wyatt: Trying to explain to people what motocross is or having my Grandma be OK with me racing. Quin: Holding on for a whole moto without losing your arms. Wyatt: Being creative with lines/passes, and jumping the triples. Quinn: Being able to race my closest friends, and go as hard as we can, and still give each other props after the moto. Wyatt: The clean up afterwards. Quinn: The substantial injuries that come with the sport. Wyatt: I want to race in AMA Supercross, compete for a Canadian championship, and be a respected 450 guy someday. Quinn: To get a National top 10 number. Wyatt: Have a company that can keep me involved in the sport and sell real estate. Quinn: To go to college for an elevator technician. Wyatt: My 2007 YZ125 or Mike Brown’s 2003 PC KX125. Wyatt: Whistler in the summer with my friends. Quinn: Raglan, a big sand pit near my house, where I grew up riding. Wyatt: Denzel Washington because that guy is badass. Quinn: Seth Rogan, because he always plays the character that seems like me. Wyatt: This is hard because I listen to a lot of music but ill say: Skeletons – Travis Scott. Quinn: Famous by Lil Wayne. Wyatt: Hockey and the Vancouver Canucks. Even though they tend to let us down each year. Quinn: Not a team sport, but snowboarding. And favourite snowboarder would be Mark Mcmorris. Wyatt: Left-over spaghetti that has been in the fridge over night. Wyatt: My grandpa’s ’67 Ford Mercury farm truck restored with a lowering kit. Quinn: Honda Civic Sport Hatchback. Wyatt: The ability to shred a piano. Quinn: I wish I was good at skateboarding. Wyatt: I went to school while I was injured with my knee and I am now a newly licensed Real Estate Agent in BC. I also enjoy film photography. Quinn: I was an Honor Roll student. Wyatt: My grandfather was a pioneer of our town where I’m 4th generation on our farm. Quinn: It is the home town of Larry Enticer? Pretty much the only thing that has happened here (laughs). Wyatt: I wish I could say yes (laughs), but I don’t think I have. 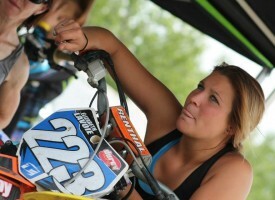 I feel like nowadays most of the chicks don’t have a clue what motocross is. But I’ll keep trying. Wyatt: Kyle Springman, Jess Pettis, Casey Keast, Dylan Delaplace. Quinn: The Pitbike Crew, Tanner Ward, Austin Watling, Baden Brunning, Seth McDowell, Daylen Vanderslaght, Shelden Litwiller, Jake Tricco, Drew and Travis Roberts. Wyatt: Live each day in the moment. Quinn: You only live once. Wyatt: I’d like to say a big thanks to the Carlson family for everything they’ve done for me this year, my family for all their support, and every else that’s backing me! Also, a big thanks to Keylan Meston for driving our rig home across the country. Sorry I couldn’t join! Quinn: My mom and dad. All of my brothers and my sister. Team Holeshot Motorsports, Blackstock Motorsports, Gamma Powersports, TCD, Fuel Clothing, Natty Seats, Amsol, 365mx, and Mitchy’s Speed Shop.